Note:these are all optional so you can pick and choose what you live based on your likes and dislikes! 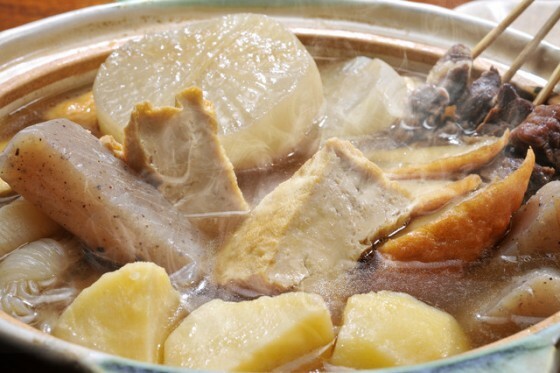 Stars (*) indicate that this is usually an essential part of oden so try it out if you don’t know what it tastes like! Peel the sides of the Daikon first. Slice the Daikon into ½ inch wheels. Cut a crosshatch into the daikon being careful NOT to slice all the way through. Take your Konjac and cut a crosshatch into the block. This will draw out the bitterness of the Konjac when you boil it and make it more delicious. Boil it with the Shirataki noodles, but separately from the ingredients in the next step. Once boiled, cool it and then cut it up into bite size pieces. 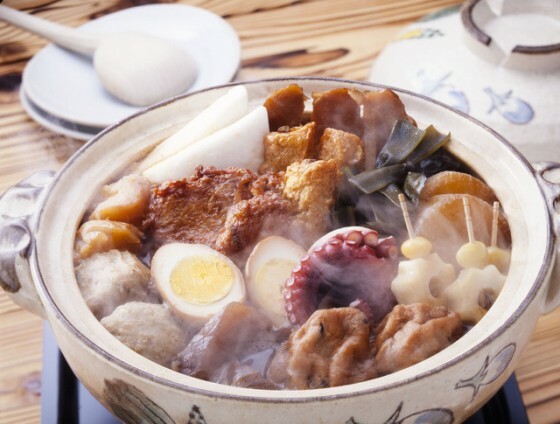 Get the eggs, daikon, and potatoes and put them together in a pot and boil them. Yes they will be just fine together. While this is boiling, get your atsuage ready in a colander/sieve. You are going to pour out the boiling water from the daikon and eggs on top of it to get rid of any excess oil on the atsuage. NOTE: DO NOT pour the water from the daikon/shirataki noodles onto the atsuage. This will transfer the bitterness of these two to the atsuage and it will not be good. One you have dumped the water over the atsuage, cut it up. You can do it beforehand if you prefer. If you are using meat or seafood or even the gyoza, have some bamboo skewers ready because you need this for the oden or it will sink and disappear. Next, put all of the ingredients for the broth together in the pot. Once they have all been combined, you can start adding everything in. Try to make sure the last thing you add in is the potatoes. If you cook them too long, they will become too soft and break apart when you try to get them. Next comes the fun waiting part. Bring the pot up to a boil and once it does, immediately cut the heat back to medium heat. Now simmer for 45 minutes – 1 hour. You now have two choices; you can either transfer things to plates and eat them try, or get bowl and put in a bit of the broth. The broth is totally drinkable by the way! I know it seems like the steps are daunting, but they really aren’t. A lot of them if just telling you to be cautious, so don’t be intimidated by it! You’re essentially making a slow cooker recipe just not over 6-10 hours!Here we are again you wonderful people. I’m so sorry that this week is over, but I really hope that you enjoyed this week’s “Eat Like Your Faves!” Keeping up with our fall theme has brought us to wonderful and widely loves dishes. Please try them out and let me know how it went in the comments below! If you have any questions/comments/concerns/requests, PLEASE do not hesitate to ask me! I’m more than happy to respond!